The Coral Sea is the body of water off the northeast coast of Australia. This basin was formed about 50 million years ago and it’s the only place where two World Heritage Sites touch: the Great Barrier Reef & the rainforest of Daintree National Park. MEET (Cool Meet Ups) – Cassowary Falls. To reach Cassowary Falls, you travel by car to the end of the Riverhome Rainforest Walk near Daintree, switch to a 4-wheel drive safari vehicle to traverse the muddy roads and to forge through river outlets, then park and walk about 400 yards into the rainforest, stepping over roots and ducking low branches along the way. 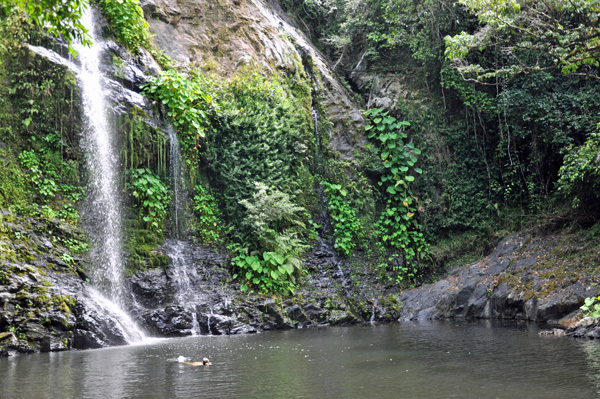 Your reward: The splendid Cassowary Falls, an idyllic spot tucked away in the foliage complete with a long cascade of water and a deep clear pool to swim. A dip in this isolated spot after touring through the rainforest all day is simply perfect! EAT (Tasty Eats) – Lamingtons. Like the U.S., Australia has very few culinary delights they can call their own. Yes, you have Vegemite (but I don’t consider this a food). There’s the meat pies – but we all know these are originally from Cornwall. And let’s not forget the barbie – but that’s more about placing raw meat on the grill. A lamington, however, is a dessert of true Australian origin. Most believe this local delicacy was named after Lord Lamington, who served as Governor of Queensland from 1896 to 1901 (although some think it was a nod to his wife Lady Lamington). Squares of sponge cake, lamingtons are first coated in a layer of chocolate icing which is absorbed into the cake, then sprinkled with finely shredded coconut. They can also feature a layer of cream or strawberry jam in the middle. Craving a moist rich dessert? Look no further than a lamington. Here’s a recipe to tempt you! SEE (Must-see Sights) – Daintree National Park. Daintree is a national park in far north Queensland comprising a tropical rainforest that has existed continuously for more than 110 million years — making it the oldest tropical rainforest in the world. An area rich in biodiversity, the park supports more than 430 species of birds. The flora is equally diverse with new species of trees, long thought extinct, having been recently re-discovered. Another of Daintree’s unique features is that this is the only spot in the world where the rainforest descends right down to the ocean’s edge. The park’s coastal mountain range slopes toward a coastline of unspoiled beaches dropping right off into the sea. Jutting out as one of the coastal headlands is Cape Tribulation, named by Captain Cook after his ship ran aground in the waters off this coast. The traditional owners of Daintree are the Eastern Kuku Yalanji Aboriginal people who still live in the area and attribute spiritual significance to many of the park’s natural landscapes. The area is also viciously guarded by the park’s natural inhabitants. 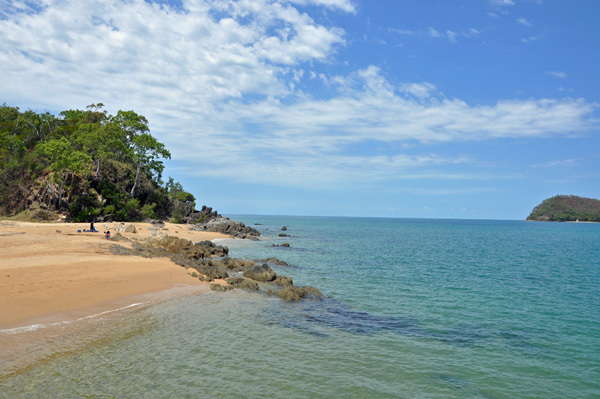 The coastline is patrolled by crocs, the inlands seas are filled with bull sharks, and the prehistoric cassowary lords over the jungle interior. Beauty beware! SHOP (Gotta Have) – Lucas’ Papaw Ointment. Since I’ve been here in the tropics, I’ve been getting lots of bites – from spiders, mozzies, and other unknown winged creatures. So I was psyched to find this local pawpa ointment to relieve some of the itch. The best think about Lucas’ Pawpa Ointment = no palm oil! ACTIVITY (Gotta Do) – Dive the GBR! You can’t travel to the Coral Coast and not explore one of the recently awarded seven wonders of the new world. The Great Barrier Reef (GBR) extends about 2,000 km (1,200 mi) along the northeast coast of Australia and comprises approximately 2,900 individual reefs and nearly 1000 islands. Not only can the GBR be seen from outer space, but it is the world’s biggest single structure made by living organisms. The reef is so fabulous it deserves a post all its own. So stay tuned – more on this to come! GIVE (Greatest Need) – Rainforest Rescue. Rainforest Rescue is a nonprofit organization dedicated to protecting and restoring rainforests in Australia and internationally. The org aims to re-establish rainforests through planting, maintenance and restoration programs, as well as purchasing and protecting high conservation value rainforest and preserving its biodiversity. Every second the earth loses an area of rainforest the size of two football fields! Get informed and help protect the earth’s precious biodiversity! ENJOY (Extra Fun) – Cassowary Encounter. Ok, this maybe shouldn’t be classified as “fun,” but I’m a little obsessed with cassowaries. A flightless bird, cassowaries are more akin to a dinosaurs than a bird and so are considered ratites — a species all its own. Standing more than 6 feet tall and with a dagger-like second toe, cassowaries are extremely dangerous. When threatened cassowaries jump back, feet in the air and swipe at their attackers, eviscerating an abdomen with ease. Not only can cassowaries run up to 50 km/h (31 mph) through the dense forest and jump 1.5 meters (4.9 ft), they are also powerful swimmers able to cross wide rivers and swim in the sea. We were lucky enough to see a cassowary in the wild, sauntering nonchalantly by the side of the road. We were extremely lucky to see one and even luckier that we saw it from the safety of our bus. An impressive – and terrifying – animal! This entry was posted on Thursday, January 9th, 2014 and is filed under Asia Pacific. Did you say 6 FEET tall – holy scary Cassowary! Yep! And they have that horn on their head that they can bludgeon you with too! YIKES!!! !